New Mexico has more than its fair share of the wacky and weird. 1. 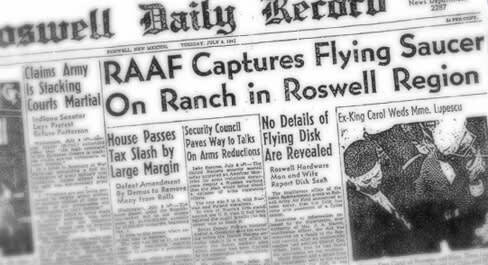 Roswell UFO Crash: Roswell has been looking for answers since something large, round, and made of a metallic substance crashed in the desert outside of town on July 2, 1947. The government initially notified the press that a "flying disc" crashed there, but soon corrected the story to say the debris was from a weather balloon. We may never know what really crashed there, but its still a topic of vehement debate today. 2. Geronimo&apos;s Skull: Some say Yale University’s Skull and Bones Society stole Geronimo’s skull from the Apache chief’s grave at Fort Sill, Oklahoma, and are currently housing it in their New Haven, Connecticut lair. One of Geronimo’s grandsons, Harlyn Geronimo, filed a lawsuit in 2009 demanding the bones be returned to their rightful resting place in New Mexico. Does the secret society really possess Geronimo’s skull? Only Geronimo’s spirit may ever know. 3. Taos Hum: A small number of Taos residents claim to be plagued by a weird phenomenon—a relentless humming noise that has been compared to a “diesel engine idling in the distance.” Known as the Taos Hum, the unusual sound has foiled investigators from Los Alamos National Laboratory and the Phillips Laboratory at Albuquerque’s Kirtland Air Force Base who have been unable to identify its cause even today. 5. Chupacabra: What do you get when you cross a vampire with an alien, a coyote, and a kangaroo? A chupacabra. The “goat-sucker” (literal translation) monster reportedly drinks the blood of livestock; its mark is puncture wounds in the animal’s necks. Newspaper reports dating to the 1950s suggest the four-foot-tall cryptid was sighted and preying throughout the Americas. Want evidence its roaming New Mexico? In 2005, several Albuquerque West Mesa residents described finding the corpse of a lizard-like beast with colorful spines. A speedy, winged creature was also spotted near Alamogordo. Is the chupacabra real or just an urban legend. Find out more: www.unknownexplorers.com /chupacabra.php or www.science.howstuffworks.com/chupacabra.htm. 6. Aliens in Dulce: Are extra-terrestrials infesting the caverns below Archuleta Mesa, outside Dulce in northwestern New Mexico? An ex-government engineer who claims he survived a 1979 firefight between aliens and the military there claims it&apos;s true. Other sources describe an underground laboratory, jointly run by alien species and the U.S. government, that harnesses magnetic energy and breeds alien/human super-species. We may never know what really exists there. To find out more: www.dldewey.com/columns/schnidrf.htm or http://aliens.monstrous.com/dulce.htm. 7. Aliens in Aztec: In March 1948, a flying saucer may have crashed in Hart Canyon northeast of Aztec. Witnesses reported finding a large, superbly crafted disc, and discovering 14 to 16 (depending on whom you ask) charred, small humanoid corpses from the wreckage. The government dispatched a team of scientists to recover the bodies and investigate them. Of course, the scientists were sworn to secrecy, so their findings still remain unknown today. To find out more: www.aztecufo.com/crash.htm. 10. Paranormal Hauntings: With New Mexico’s history dating back thousands of years, its no wonder that tales of ghosts and specters abound. From Civil War battlefields to the New Mexico State Penitentiary, the Southwest Ghost Hunter’s Association has investigated paranormal activities around the state. To find out more: www.sgha.net/invest_nm.html.